Nowhere else in the world is poster design more of an art form than it is in Italy. In the country’s golden era, classical painting fused with the fantasy of cinema and the result was intoxicating. Inspired by the cinematic extravaganza of this year’s Venice Film Festival, The Reel Poster Gallery thought it appropriate to bring to the fore this heavyweight in poster design – more dazzling than any film festival red carpet..
How would you characterise Italian posters? The golden era of Italian posters spanned 1930s – 50s, and posters of this period are immediately recognisable because of their signature glamorised painterly style. This approach was dramatically different to British and American posters that portrayed the actors more realistically. Contrasting styles can easily be seen with the US and Italian posters for American film noir White Heat (1949). From the 1960s onwards Italian posters, like those in other parts of the world, also adopted a more photographic aesthetic as the ‘photo montage’ came into being. Italian artists during the golden era were often classically trained and had a far more creative scope than their counterparts, as distributors could alter style briefs as they liked to increase the seduction of a poster. The glamorisation of women and a flaming colour palette were Italian poster trademarks. Creative license was not limited only to the image but often used on the title as well. The Italian distributors would change the original title of the film to suit their domestic market, and to increase its allure or to heighten suspense; Rope (1948) starring James Stewart was changed to Nodo alla Gola or ‘Lump in the Throat’, Cover Girl / Il Fascino (1944) translates to ‘The Charm’, Peeping Tom (1960) appears as L’Occhio Che Uccide or ‘The Eye that Can Kill’; or quite brilliantly Rawhide (1966) was translated to Il Magnifico Straniero, ‘The Magnificant Stranger’. The sum of all this creative adaptation meant Italy produced some of the best posters ever created, and certainly some of the gallery’s favourites. Which artists are most collectable? Anselmo Ballester (1897 – 1974) and Luigi Martinati (1893 – 1983) are two stand-out Italian artists that dominated the golden era of Italian poster art. Both attended the Academy of Fine Arts in Rome, and in the mid 1940s they went into business together, along with fellow artist Alfredo Capitani, to create BCM studio dedicated to film poster advertising. Both artists were greatly influenced by classical painter Federico Ballester who was father to Anselmo and tutor to Luigi Martinati. View all Ballester posters currently in stock. View all Martinati posters currently in stock. 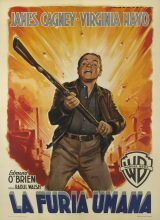 What are the most important Italian posters? The Italian posters for classic Italian films like Stromboli (1950), Fellini’s 8 ½ (1963), and of course Le Dolce Vita (1960), are very collectable and command high prices. Also the Italian versions of major US titles are incredibly popular with collectors. Gilda (1946) and Lady from Shanghai (1947) are stand out examples. The US poster for The Lady From Shanghai is very collectable and sells for thousands, but Ballester’s version has the status of a masterpiece in the collector’s market and sells for tens of thousands. To get started I would explore 28 x 13 in. size posters, also known as ‘Locandina’. These small Italian posters were created to go outside the cinema in a glass display case, and so are relatively well preserved in contrast to larger posters of the same design (79 x 55 in. ) that were glued to billboards. Unsurprisingly few of these larger posters survived and so their rarity means they are highly sought after and valuable. Smaller posters are also easy to house, low cost to frame, and still feature the same spellbinding imagery – a great place to start your collection. Browse the Gallery’s full selection of original Italian posters by clicking here.